Hi and welcome! I'd like to invite you to join our free weekly email newsletter . We'll send you yummy (and frugal) recipes on Sundays, just in time for your weekly meal planning. Thanks! Swiss chard is one of those intimidating vegetables. 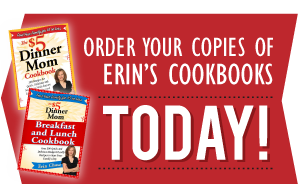 Until you figure out that it cooks just like spinach…and works just like spinach in just about any recipe! Spinach, whether fresh or frozen, is one of those ingredients that I use often in “red sauce” meals with pasta. And this Swiss chard recipe will soon become Exhibit D. Or exhibit A of the “swiss chard and red sauce” files. This chard is straight from the garden. Thanks to all the rain and cool weather this spring, the chard really grew strong and well! I’m so glad to have had so much to cook with this year, and I’ll be making the again soon with chard from the farmer’s market (after mine runs out!). *Note: this recipe does call for leftover spaghetti sauce…about 1/3 lb. ground meat plus . If you don’t have any on hand, I highly recommend making up a big batch…then use some for this recipe and freeze the rest. Then you’ve got some ready when you need a night “off” from cooking. 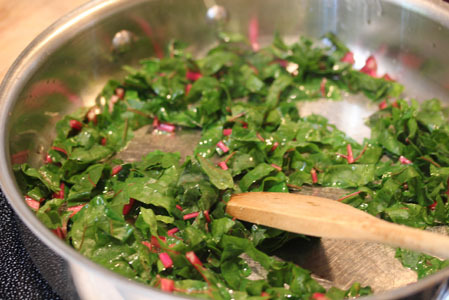 Add the olive oil to a 12 inch deep dish skillet and saute the chopped Swiss chard leaves for 2-3 minutes, or until bright green and soft. Stir in the leftover spaghetti sauce and some Italian seasonings, if necessary. Stir in 2 cups of hot water, along with the pasta noodles. Gently combine so the pasta noodles are under the liquid. Add more liquid, 1/4 cup at a time, until all the pasta is under the liquid. Bring to bubbling, then cover tightly and cook over medium heat for 8- 10 minutes, stirring once. Once the pasta is al dente, remove the skillet from the heat and uncover. Let sit for a few minutes and let the sauce thicken if necessary. 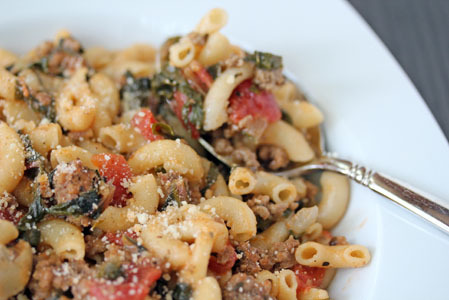 Toss in the Parmesan cheese and stir into the skillet pasta dinner. 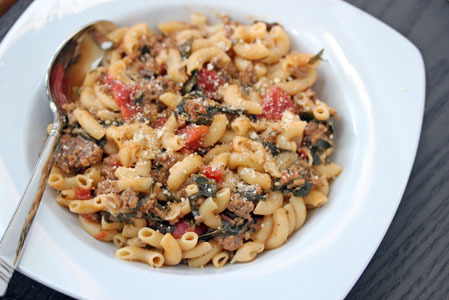 Serve Skillet Macaroni with Swiss Chard. This entry was posted in Recipe, Skillet Dinner. Bookmark the permalink. I will be giving this recipe a try this week. Just got a load of Swiss Chard with my CSA share and was wondering what to do with it. Thanks!